If you are at the NEC classic car show this weekend why not drop onto the TR Register stand and see the fully restored Police car. Neil Revington has spent several years restoring the TR4 to its former glory. 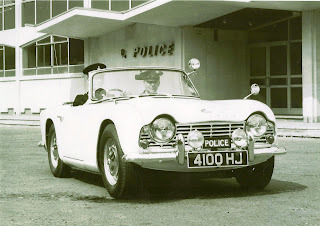 Now on show for the first time since its restoration has been completed it is a fine example of the TR4 in Police guise. If you would like to discuss any aspects of the car or would like RevingtonTR to carry out restoration work, small or large, or service work on your TR, please give us a call on +0044(0)1823698437. According to one of the audi dealers that I talked to last month, vintage cars are not necessary in this day's era. It's more of a luxury than a need. Anyway, I like the exterior design of this car. It looks so cool. I look forward to seeing one.